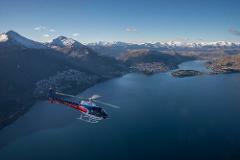 Designed to surprise, this spectacular scenic helicopter flight maintains a relaxed and leisurely pace whilst exposing a dramatic panorama of Lake Wakatipu and Queenstown township. Fly past the canyons of the Shotover River, the ski slopes of Coronet Peak, and rural retreats and villages that Queenstowners call home. Land high above Queenstown on a craggy mountain precipice. 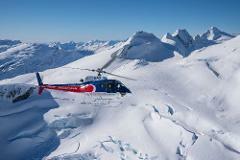 Get that perfect photo in amongst the Southern Alps. Even in summer you may have the chance to touch snow. 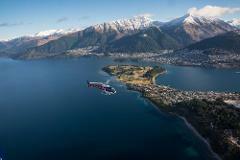 This journey offers dramatic views of the majestic Southern Alps and the Aspiring National Park including the mighty Rees and Dart valleys, and Lake Wakatipu's northern shores. 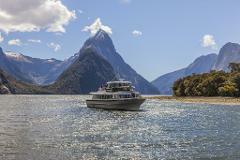 Take in the epic scale of the Southern Alps and The Divide on the way to Milford Sound. Fly over secluded alpine lakes, sky-high waterfalls, lush pristine rainforest, ancient glaciers and rugged peaks before the thrill of an alpine landing. Go one step further taking our Milford Sound flight and a Mitre Peak Cruise to experience the Fiordland National Park from the sky, land and water. 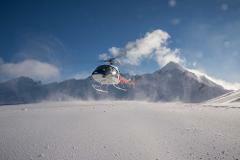 A remote alpine landing tops off your exploration of a UNESCO World Heritage wilderness. Today your Pilot chooses your scenic adventure! Experience views of majestic Queenstown as you perch on rugged mountain terrain, you may even be standing on snow in the winter. Lift off for a spectacular flight landing on The Remarkables Mountain Range. 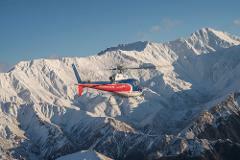 Continue the flight into the Gibbston valley region for a unique wine tour. 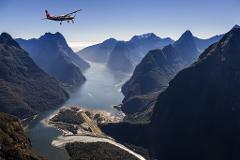 Fly by plane to Milford Sound, Cruise the fiord with Mitre Peak Cruises and fly back to Queenstown by helicopter. If conditions allow you may even get to experience a remote glacier landing.